Conveniently create just the right light for reading, watching TV, or entertaining, with the Caseta Wireless plug-in lamp dimmer. The plug-in lamp dimmer simply plugs into a standard outlet and can be used in conjunction with up to two lamps. It works with dimmable LEDs and compact fluorescent (CFL) bulbs, as well as incandescent and halogens. Conveniently control your floor or table lamps with a Pico remote control, sold separately. 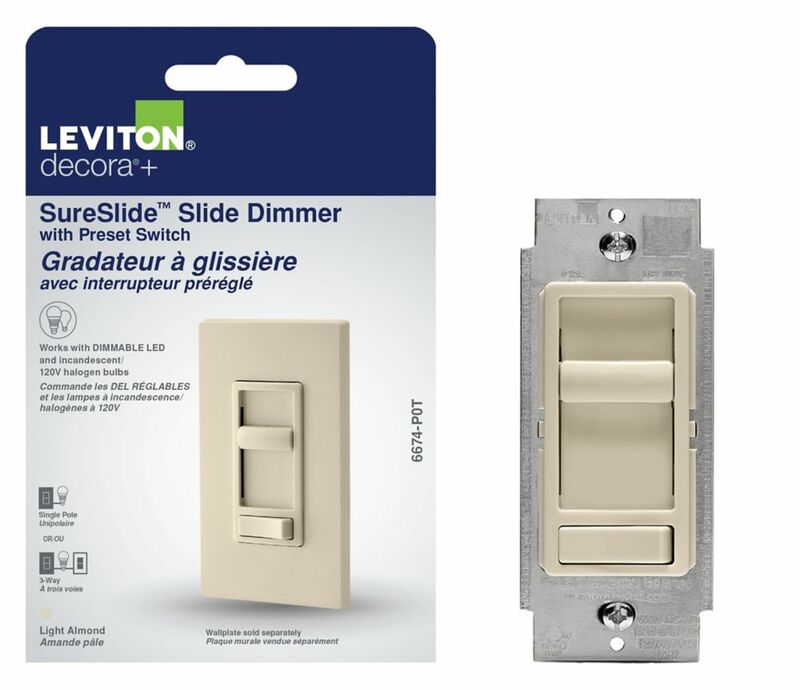 SureSlide Universal Slide Dimmer with Preset in Off-White Leviton Decora SureSlide<sup></sup> dimmers provide smooth, slide-action, full-range dimming for incandescent and dimmable LED and CFL lamps. Featuring a pre-set ON/OFF switch, this device allows the user to set the desired brightness level to operate automatically with the ON/OFF function. The dimmer is designed specifically for dimmable light-emitting diodes (LED) and dimmable compact fluorescent (CFL) lamps; it is also compatible for use with incandescent lamps. SureSlide Universal Slide Dimmer with Preset in Off-White is rated 4.4 out of 5 by 78. Rated 5 out of 5 by Chris from Easy glide, no knob to turn and break, and simple to install. Easy glide, no knob to turn and break, and simple to install. Rated 5 out of 5 by Ken from The installations and schematics for installation were clearly identified and understood. The installations and schematics for installation were clearly identified and understood. Rated 5 out of 5 by BigJoe from Easy to install. Like the off/on switch.... Easy to install. Like the off/on switch.